Caribbean Website Designer » Which web browser are you using? If you are not tech savvy, it is likely that you are still using the web browser that came pre-installed on your PC. Yes, I am speaking about the people that still use Internet Explorer (IE). My own experiences using web browsers over the years since I've been in the web business informs me that I should stay away from it. But that is a personal choice. My reason, and that of all web developers, for ignoring IE is that it renders websites and their function inconsistently compared with other web browsers. IE and its layout engine, Trident, has often lagged behind other browsers in its support of modern web standards. In addition, IE has a long history of major security breaches. Following security issues with the browser in 2010, Germany and France called upon its citizens to stop using the browser. 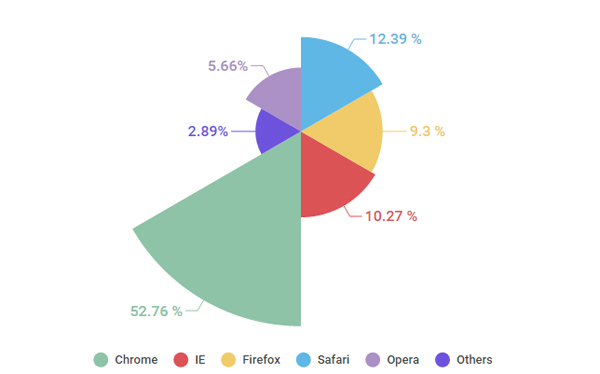 Google Chrome, then, is by far the most used browser which accounts for over half of web traffic, followed by Safari in a distant second place. Internet Explorer comes in third, with Firefox fourth. Often when the client is told to try a different browser, they report back that they are not experiencing the same issue. That is a win for me and all the others that publicly call for a ban on IE browser. It's your turn! So go ahead, tell me about your experiences with IE.